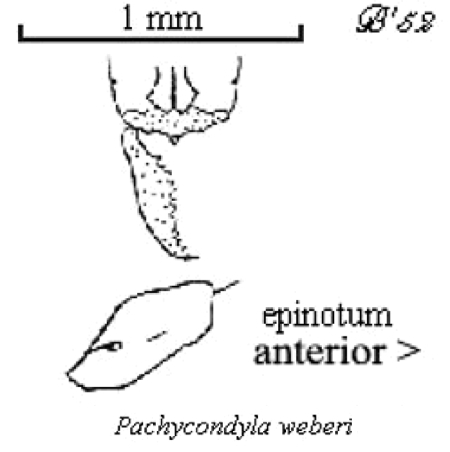 Type location Guinea (Euponera (Xiphopelta) weberi, Bernard, 1952: 194, illustrated, worker; in Pachycondyla Bolton, 1995: 311; new placement by Schmidt & Shattuck, 2014: 111), Kéoulenta savanna, Mt. Nimba (27-iii-1942, Lamotte); holotype worker only found and described; named in honour of N.A. Weber (see Bolton, 1995) . TL 3.2 mm, HL 0.8, HW 0.55 mm. Colour red-brown, darker on the gaster, antennal lobe and mandible bases; appendages yellow. Overall shiny but head, thorax and abdomen with very visible medium reticulation. Propodeum and petiole smoother. Sparse white hairs, dense on the petiole scale, white pubescence on the head. Head shape parallel for most of its length, unlike its larger relatives. Clypeus yellow, with large puncturations, anteriorly sinuated, median point blunt. Mandibles yellow, little puncturated, distinctly differing from other "Xiphopelta" by the progressive widening; 13 large, contiguous, yellow but somewhat inequal, teeth. Eyes small, some 8 facets, 3.5 times further from mandible bases than their length. Frontal lobes more angular than other relatives. Propodeum (epinotum) with obtuse angle, the two faces seeming equal. The photomontage of the type worker is collated from http://www.antweb.org/specimen.do?name=casent0907251 .